Kyoto, the old capital of Japan, is a beautiful city with many shrines and temples, and, of course, the Imperial Palace. It was also the most expensive place to stay on my trip – book early, would be my advice, if you want to get a room in a hotel downtown. And be prepared to stay in the tiniest room you can think of – even if you book the “bigger” one. Mine was 151-sq-foot (14-sq-meter) but I think that included the bathroom. It felt especially small, since you still have virtually every convenience you can think of in a hotel room in there, from water heater to iron to humidifier (no closet, though). Be flexible, is all I can say. Literally. It is worth it, though. If you are still jet-lagged and up early – why not take walk or take the bus to the Yasaka Shrine at the end of Shijo Dori Street before the city awakes. You can explore the huge complex, with one temple more beautiful than the other, on your own. The colors are stunning in autumn. In order to restore one of the temples, the Japanese build a huge hall around it. On your way back into the city, you may want to walk along Shirikawa-minami Dori. 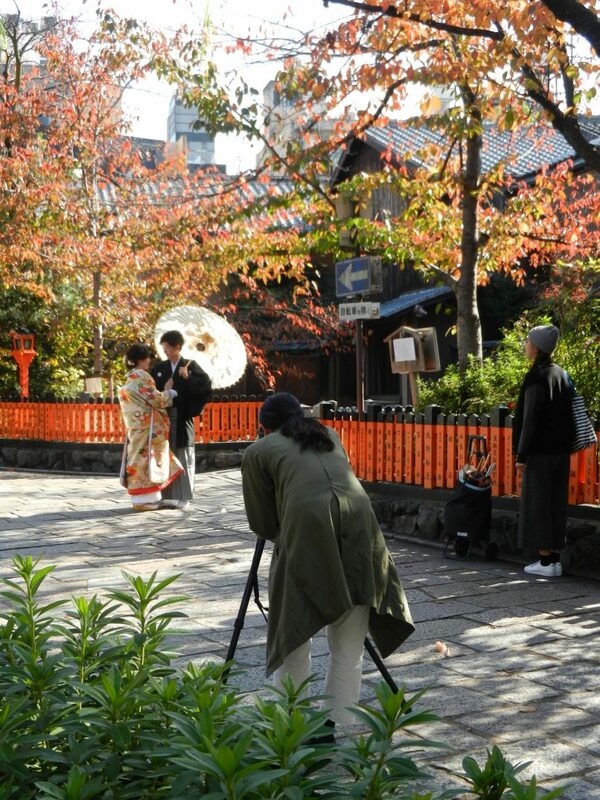 It is supposedly the prettiest street in Kyoto, and if you are lucky, you see couples in traditional Japanese garb posing for their wedding pictures. I also visited a little shop close by that has a beautiful exhibition of fabric and art, and sells pieces of traditional kimonos under glass. They are quite durable, and can be used as coasters, or serving plates. The shop is called Wa-Glass Ya, and it was located 70 Motoyoshicho, Higashiyama Ward. The website is currently not accessible, but maybe the shop is still there. And don’t forget to visit Nishiki Market with its many food vendors – maybe you even want to taste the traditional dishes yourself. Of course, Kyoto has a tower, too – with an impressive train station right next to it. And last but not least, there is the Imperial Palace. I guess it is a must see, but don’t expect to be alone. Personally, to be honest, I preferred the solitude and hidden charm of the Yasaka Shrine. PS: Next week, we’ll travel to Hiroshima.